As someone who resides in a country where the terms "professional" and "amateur" have become practically meaningless in the world of the theatre, I was fascinated to read in yesterday's edition of The Stage that Britain's mighty Royal Shakespeare Company will feature "an increased focus on amateur theatre" when it re-opens on November 24 in Stratford-Upon-Avon. "As part of a programme of work between now and 2012 with the World Shakespeare Festival, we are very interested in trying to renegotiate the relationship between amateur theatre and professional theatre in this country. We're sticking the amateurs centre stage with our opening - with an open house night of local amateur performers, with another night where there's amateur choirs from across the UK, as well as a major thing from school kids...There's been a sort of crucifix and garlic mutual relationship between the amateur sector and the professional sector for too long. It's been fine for professionals to work in 'community theatre', that's been kosher, but to actually acknowledge that quite a substantial proportion of people working in professional theatre started out in local amateur groups, that is a well kept secret. People pretend they know nothing about it, but it is the case. I think there is something about the relationship that an amateur theatre has with its audience that we in the professional theatre can learn from, and there are obviously skills that we can share." The RSC's decision is very much in keeping with a general trend where museums, symphony orchestras, dance companies and myriad other types of arts organizations are looking for ways to make their work more inclusive and interactive. 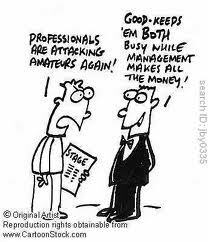 I wonder if theatre is the final frontier in the UK for bringing so-called amateurs and professionals together? It strikes me that there has always been such a stigma against "am dram" in Britain. This view doesn't exist to the same degree in the US. I don't think that it will go away just because the RSC has decided to acknowledge the place of community theatre, especially since much of the amateur-inclusive programming appears, at least as it's described in the article, to be more of a gesture to draw attention to the launch of the new RSC than a concerted effort to engage amateur theatre people in the long term. It's a laudable gesture, mind you. But perhaps the RSC's move signals the start of a greater acceptance that the worlds of amateur and professional performance have a lot more in common than people like to think? Over here, the two categories have been bleeding into one another for decades, partly because of the paucity of funding for theatre at any level. The Brits could learn a thing or two from watching how the worlds of amateur and professional theatre, such as they are, interact in the US.